Gift set of 3 monogram embroidered handkerchiefs with an initial of your choice inside a red love heart outline. Gift set of 3 monogram embroidered handkerchiefs with an initial of your choice inside a red love heart outline. Ladies or mens handkerchiefs with your choice of personalised initial for a special gift. Select from ladies or mens size white cotton handkerchiefs and enter the single letter to be embroidered inside a love heart. Gift set of 3 monogram embroidered handkerchiefs with an initial of your choice inside a red love heart outline. Ladies or mens handkerchiefs with your choice of personalised initial for a special gift. 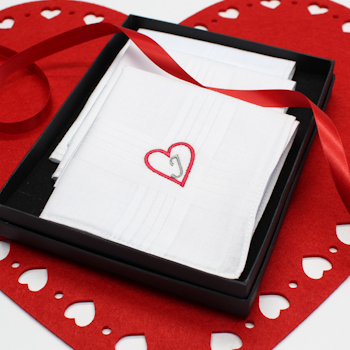 Select from ladies or mens size white cotton handkerchiefs and enter the single letter to be embroidered inside a love heart. Your choice of optional gift bag or box presentation.